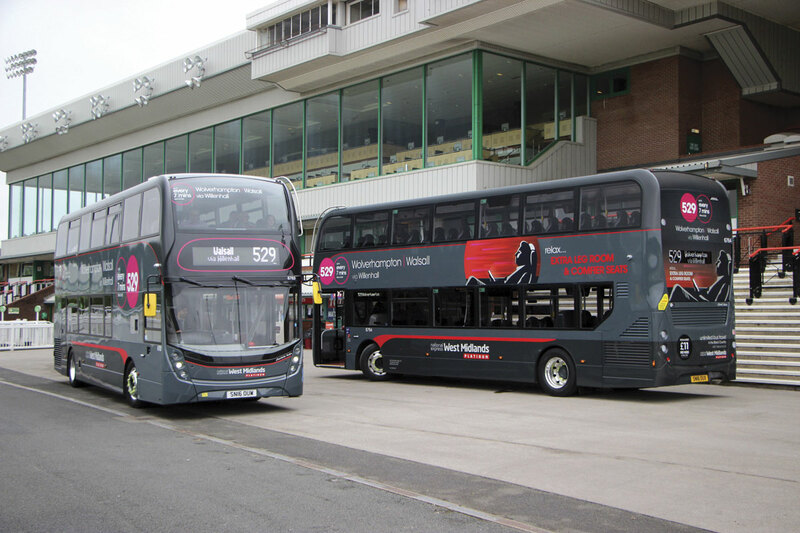 The latest stage of the rollout of National Express West Midlands’ premium Platinum brand is underway, with the first vehicles from this year’s batch of 96 already operating from the Park Lane depot in Wolverhampton. 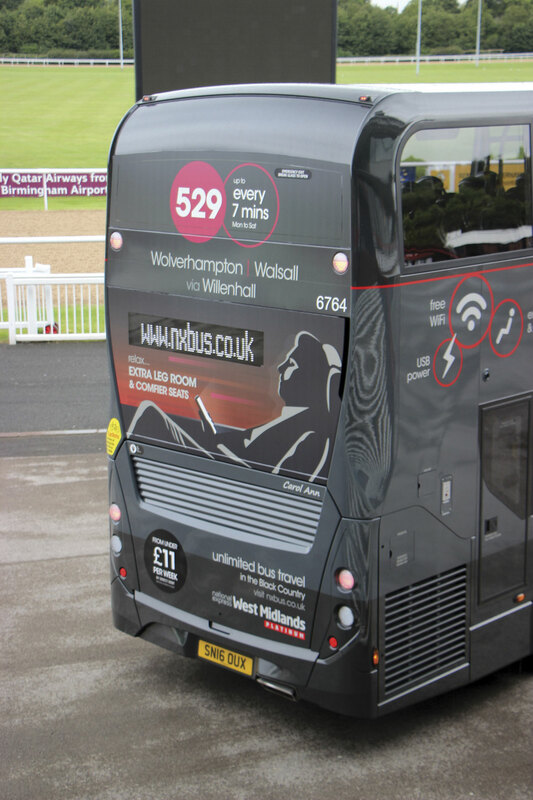 Their arrival was marked this week with a press launch at Wolverhampton’s Dunstall Park horseracing track with two of 37 buses scheduled for the 529 and 126 services present. 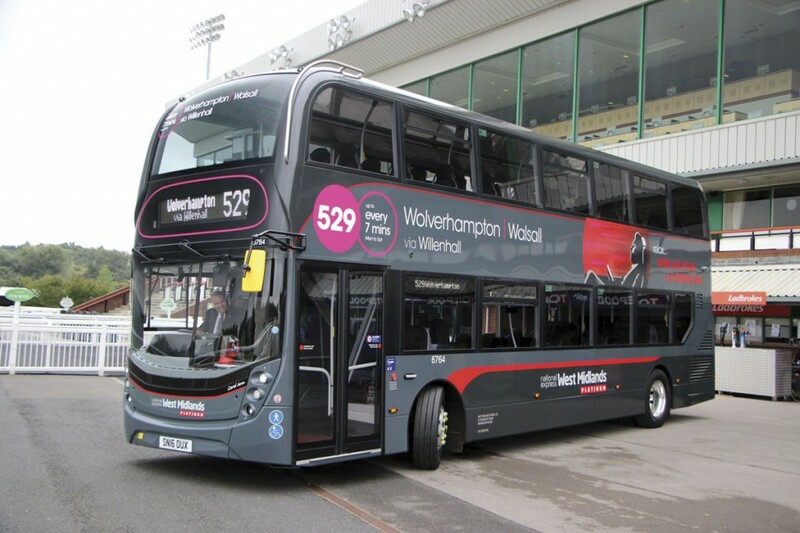 Both were fully branded for the 529 between Wolverhampton and Walsall with those for the 126 Wolverhampton to Birmingham service scheduled to arrive soon. Apart from the 37 buses for Park Lane, this year’s Platinum intake will be allocated to Birmingham Central depot, where 34 buses will replace 2015 Platinums on the 900 and 957 services, and Perry Barr, where the remaining 25 buses will be allocated to routes 902, 904 and 905. All will be in service by December with deliveries running in accordance with schedule. 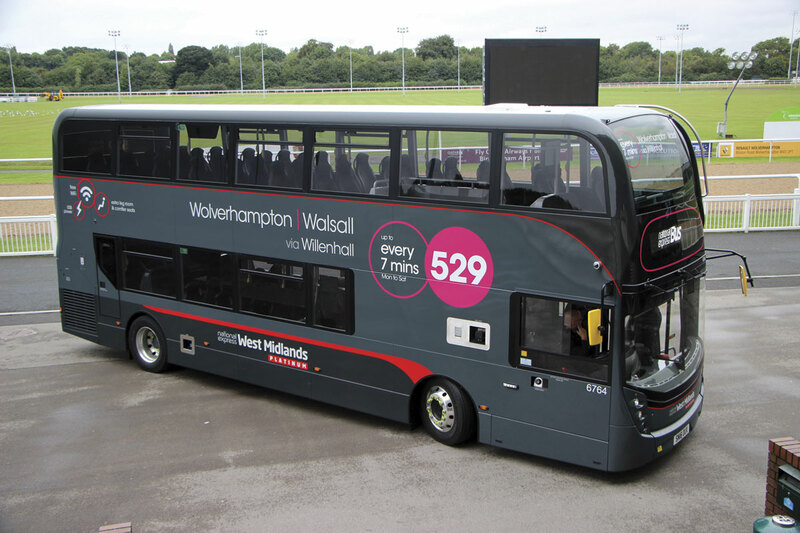 Of the 18 Platinum buses being cascaded from Birmingham Central, eight are for Acocks Green for the 966, one is to increase the PVR on the 937 service run by Walsall depot and nine will go to another Black Country depot, Pensnett, for deployment on the X10 Merry Hill to Birmingham route. Clear evidence that Platinum is delivering results can be seen in the performance of the 900 service since it began in May last year. Patronage growth is currently 11% and continuing to grow. The Platinum brand is part of National Express West Midlands’ contribution to the West Midlands Bus Alliance. 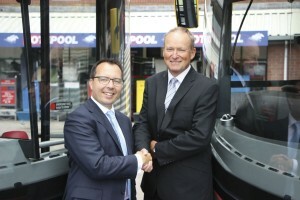 Chaired by Passenger Focus, this is a partnership committed to improving bus travel in the region. It encompasses all West Midlands bus operators, TfWM (part of the West Midlands Combined Authority), the local highways and transportation departments, Local Enterprise Partnerships (LEPs), the Safer Travel Partnership and influential local councillors. By 2020 it plans to have delivered on seven key target areas: fare-capping and contactless payment on all of the region’s services; all buses to be Euro5 or better; an open-data approach for all non commercially sensitive data; a single public transport identity; a reduction in delay minutes across the key route network; network developments plan in place and maintained funding for the Safer Travel Partnership. National Express West Midlands has undertaken to keep customer satisfaction at 85% or better, increase patronage by 5% overall on 2015 levels and reduce emissions. In return it gets to work closely with the local Highways Authority which has the ability to introduce the necessary changes, and the LEPs which have the money in order to achieve commitment to improving traffic flow. Proof that the approach works can be seen on Lode Lane in Solihull where measures to improve journey times, including road widening to incorporate a bus lane and a roundabout bus gate, are now complete and are working very well. In another joint funding development with TfWM, in service cleaning is further enhancing the Platinum experience. National Express West Midlands is good at partnerships, another example being the local charity partnership that saw the presentation of the event compered by local DJ, Dicky Dodd of Wolverhampton’s Signal 107 radio station, along with Scott Lyons of Tata Steel. Added to the Platinum specification for 2016 are USB charging points, stop/start technology and alloy wheels, the latter two features being part of a package of measures including Voith automatic transmissions, that enable the buses to satisfy the Low Carbon Emission requirements, offering significantly lower emissions than the 52/03 plate Alexander ALX400 bodied Tridents they are replacing. Apart from the smart two tone grey Platinum branding they carry, other aspects of the specification carried over include free on-board Wi-Fi, enhanced leg room, next stop announcements, interior video monitoring and plush high backed Lazzerini coach style seats, although these too have been enhanced on the latest deliveries with the edging and headrest in E-leather as well as Platinum tags. Drivers have special Platinum uniforms and undergo additional customer care training. 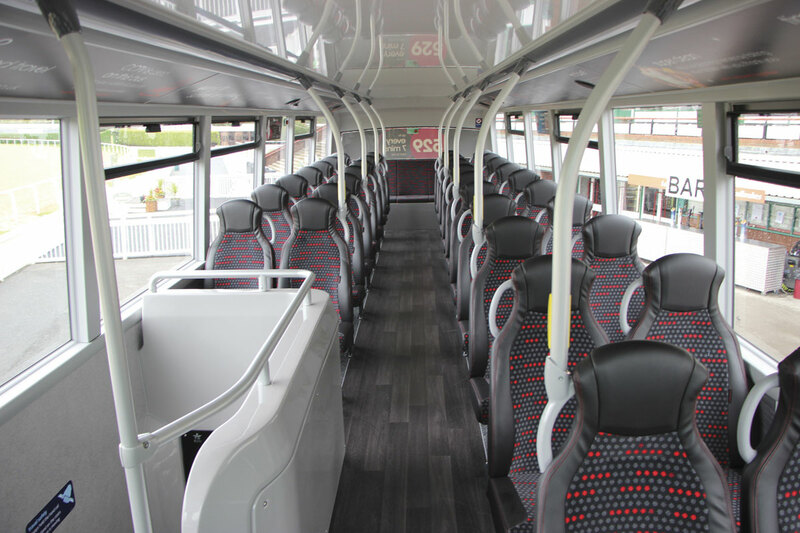 The buses are all 10.9m ADL Enviro400 MMC double deckers with 43 seats on the upper deck and 30 on the lower. 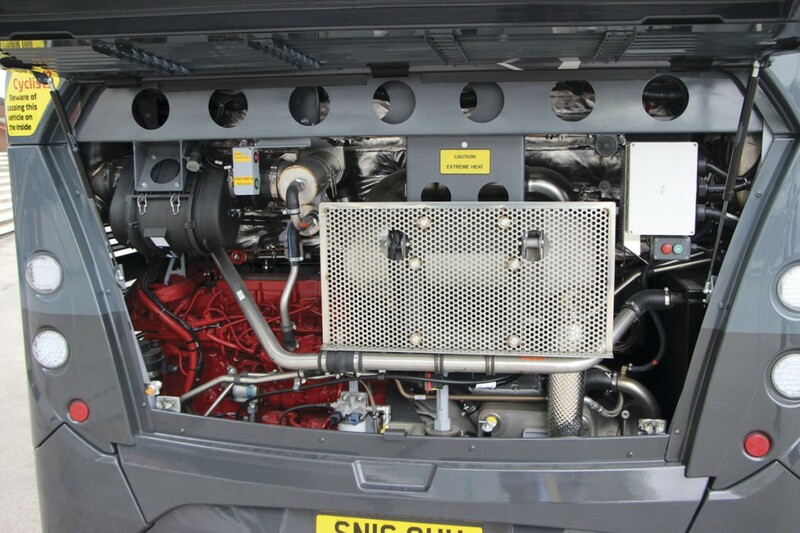 They are powered by Euro6 Cummins ISB6.7 six-cylinder Euro6 engines featuring the latest stop start technology and developing 250hp (187kW) at 2,100rpm. For 2016, the Voith D854.6 three speed automatic transmission with Sensotop and integral retarder has been specified, a key element in the bus meeting the Low Carbon parameters. Axles are Dana NDS80LF at the front and the ZF AV132/80 at the rear. 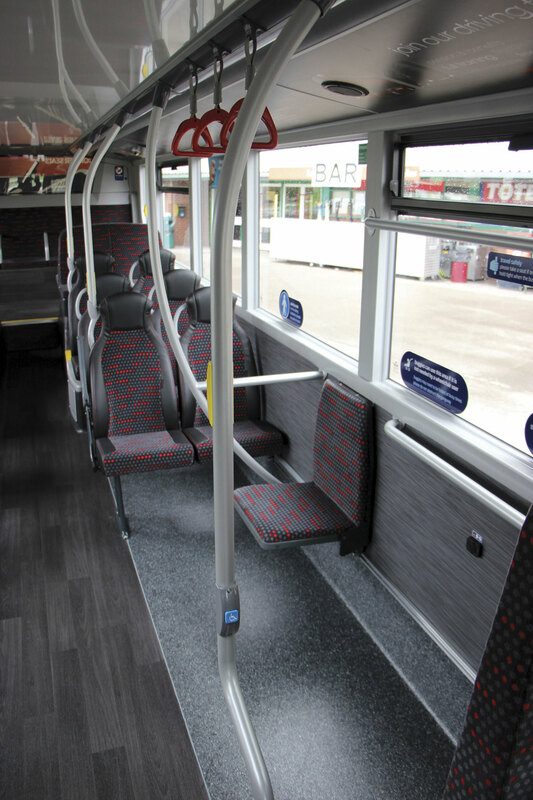 Smart accessories are fitted including e-cooling and the buses have Groeneveld’s Fluidmaster system to simplify level checking. The unladen weight is 10,690kg. Stop/start technology coupled with other weight saving measures should generate noticeable fuel savings coupled with emission reductions. A really impressive feature that I had not previously seen was the driver activated message played through loudspeakers in the vicinity of the wheelchair bay. It went: ‘Your attention please, we have a customer boarding that needs to use the dedicated wheelchair space. Please vacate the area to allow them to travel safely. Thank you.’ The recording, the volume of which can be varied, plays twice once activated. It is hoped and intended that it will take the conflict out of such situations for the driver. All of this year’s buses are being equipped with it and if successful it will become standard on the fleet. Something else I hadn’t previously seen and thought extremely useful were the details on the upper deck coving of connections the 529 service makes in both Wolverhampton and Walsall. 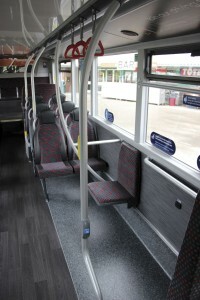 It not only helps those connecting but encourages passengers to use the company for other journeys. 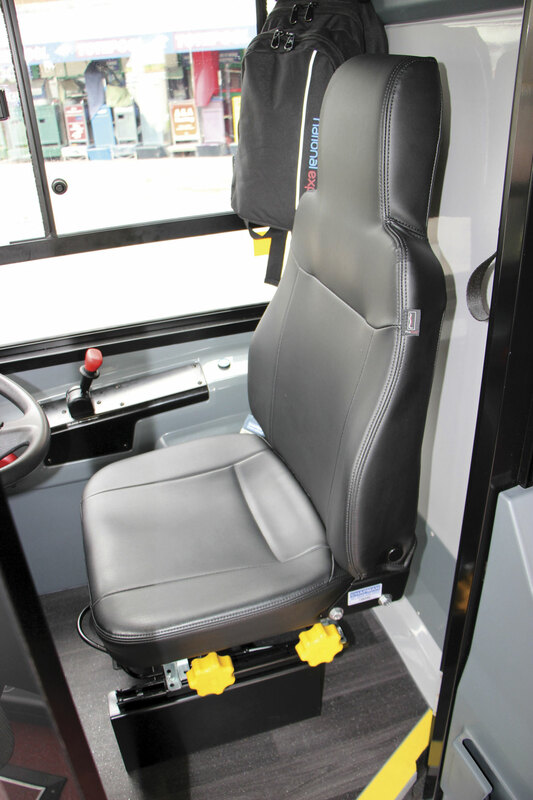 Drivers will welcome Chapman Driver Seating’s new Sideriser2 seat pedestal with a simpler adjustment mechanism enabling drivers to work out the settings they find most comfortable and then dial them in to any bus they travel on. 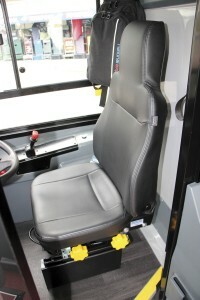 This is matched to a Probax driver’s seat cushion which enhances comfort and posture. 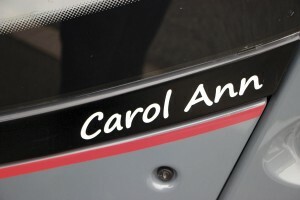 In accordance with recent practice, all Platinum buses are being named after female relatives of staff members. The two buses present were Carol Ann, named after the late mother-in-law of Wolverhampton driver Nigel Matthews, and Charlotte Roisin, after the wife of National Express’ Group Finance Director, Matt Ashley. 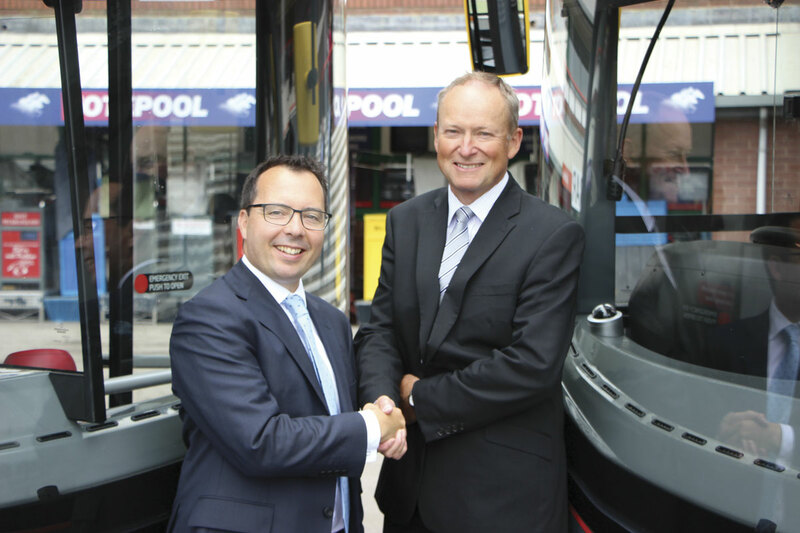 A lot of good things are happening in the West Midlands and in Wolverhampton in particular, where local driver Craig Lockyer recently triumphed in the Bus Driver of the Year competition, staged in Blackpool. 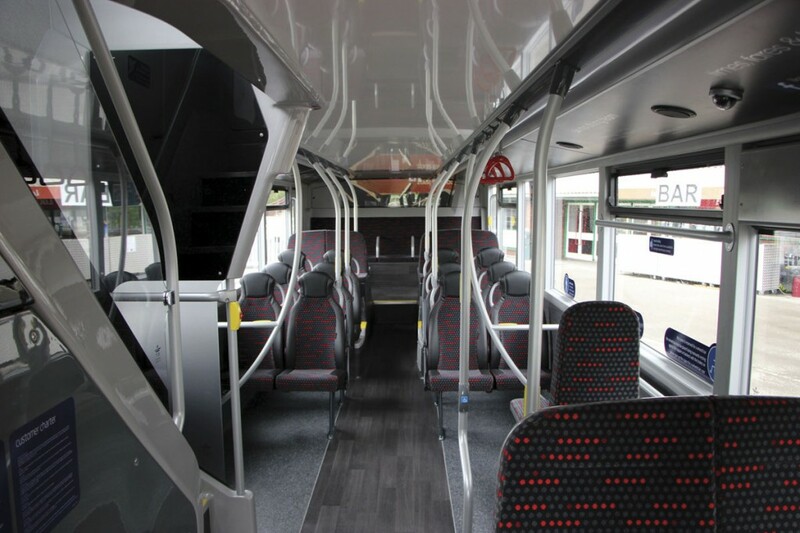 There is more to look forward to still, with not only the new Platinum buses but also new electrics and possibly hydrogen fuel cell buses to come.